April is Oral Cancer Awareness Month: Don’t forget to Get Screened! Soap stars cancer battle even though oral cancer kills more Americans every year than ovarian and prostate cancer COMBINED. There has been very little publicity about this deadly disease. Recently there was an article in People’s Magazine about Grant Achatz, the chef of Alinea Restaurant in Chicago, who was diagnosed with cancer of the tongue. Last week actress Colleen Zenk Pinter from “As The World Turns,” who has been fighting oral cancer for the past seven months, was interviewed by Hanna Storm on CBS about her Battle. Like most cancers, it starts below the surface. By the time it shows up on the surface so it can be seen or felt, it is often very advanced. Unlike most other cancers, the cure rate for oral cancer has not improved much in the last 30 years because oral cancer is usually found too late. Ovarian cancer has the PAP test and breast cancer has the mammogram, but there has not been a reliable test for oral cancer. The newest technology is called a Visilite Examination. Visilite can “see” below the surface to detect lesions that are too small to see or feel before they get advanced. A special light causes otherwise invisible lesions below the surface to glow white. It just takes a few minutes at the Dentist. The American Dental Association and the American Cancer Society recommend a cancer screening once a year so everyone should take advantage of this simple, non-invasive and fast test. High-risk patients for oral cancer include those who smoke, or use chewing tobacco, drink alcohol or have a personal or family history of cancer. 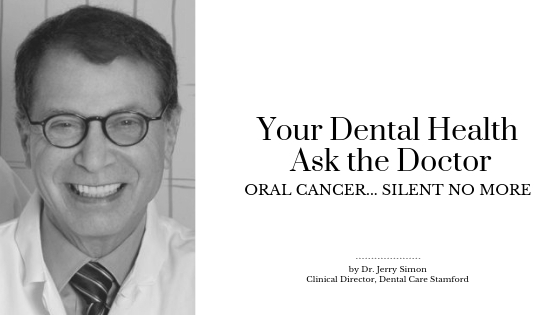 However, studies show that 25% of cases of oral cancer occur in patients who are not in the high-risk category.